Back to Library » Smart City » Street light poles are really valuable. Do you know why? Voyager, master facilitator, story teller, artist, fencer, geek, believer in people and democracy…and Deputy City Manager of the City of San Jose. Cities today are expected to do more with less: better services and more transparency, but with smaller budgets and less federal funding. The value of street light poles is largely unrecognized and untapped, but also rapidly increasing — this is extremely unique when it comes to public assets. How cities and utilities approach the value of their street light poles could lay the foundation for improved economic development, digital inclusion and smart cities. Or it could lay the foundation for an enormous missed opportunity. As the private sector succeeds in giving consumers more and better digital service experiences — think streaming movies on Netflix or rapid delivery with Amazon Prime — cities face increasing pressure to up their own service experience. Citizens expect to pay their water bill online with a simple app, and many balk at paper bills. New government technologies promise cheaper, better, faster city services. But to achieve the promise of this smart cities wonderland, local governments have to be innovative in their approach to service delivery and nimble in seeking out new sources of revenue. With the triumph of mobile and the resulting desire to fully build out 4G/LTE networks (with 5G fast on the heels), there are few government assets that represent as much of an opportunity as the street light pole. This ubiquitous ‘vertical street furniture’ is now at the heart of both the local government innovation imperative and the never-ending hunt for new revenue sources. While the value of street light poles is largely unrecognized by the public sector, it is thoroughly understood by the telecommunications industry and others who intend to profit from the next wave of the mobile revolution and the Internet of Things (IoT). How cities approach their street light poles could lay the foundation for improved connectivity, digital inclusion, and more modern delivery of public services. Or it could it could go down as an enormous missed opportunity. Cities chasing the value of their street light poles before the opportunity disappears. In San Jose, we’ve decided that the best approach is to see the value of our street lights as contributing to a closed loop of improving connectivity for all. From that basis, we work with telecommunication companies at the local level to find and expand the opportunity for mutual gain, while opposing new state or federal legislation that takes away local control. This collaborative ‘connectivity first’ approach shifts away from a pole by pole permitting or revenue fight and puts us on the same team, facing the opportunity to expand connectivity together. In this way, we are open to improving our processes to move at the speed of business and use just enough government intervention to reach a tipping point: where Telcos can meet their goals of rapid, predictable deployment at scale, and the city can ensure more equitable access to connectivity that lays the foundation for the smart city of the future. Mobile: The mass adoption of mobile technologies. Think iPhone. Data: The exponential growth in data usage and increasing sophistication in data analytics. Digital Services: The increasing customer expectations for instantaneous and novel services. Can you even imagine mailing a letter to a catalogue and then waiting 6–8 weeks for delivery anymore? Just think about how you used to use your phone 10 years ago — we were fine with a halfway decent voice call and some texting. Now, we expect to stream movies on our phone while they’re mapping our location and paying for our coffee, all without missing a beat. A few milliseconds of latency in an on-line transaction can cause an impatient millennial (or boomer) to abandon a purchase and go on to the next thing. These factors are motivating the completion of the 4G/LTE build out and the pending upgrade to 5G mobile networks. The bottom line for city folks who don’t work in telecommunications is this: with 5G will come incredible opportunities for the Internet of Things (IoT). IoT encompasses all of the technologies — the sensors, lights, meters (and analytics) — that can dramatically improve city services through improved awareness, responsiveness, and flexibility. IoT technologies can improve city services by allowing our infrastructure to ‘talk’ to us and itself. For example, today a fire engine has to blare its sirens and cautiously inch through a busy intersection against the light. With IoT, the fire engine can use IoT to let a system know its location and destination and the system can use IoT to tell the traffic signals along the route to turn green for the engine and stop all cross traffic. This isn’t science fiction; we are currently in deployment of a system like this in San Jose right now. San Diego is using cameras built into connected streetlights to monitor pedestrian traffic and reroute cars during peak hours to avoid pedestrian accidents and alleviate congestion. Camden, New Jersey, is using gunshot detection technology to try to improve public safety. All of these and similar systems will be built on networks that will increasingly rely on the height, power, and near ubiquity of the street light pole to mount and power the dense network of small cells and sensors that are required. The result is the value and importance of our street light poles has skyrocketed and private companies are now vying to be the first to secure the best locations and deploy improved services. They are also working hard to change federal and state laws with the goal of reducing local control, give them by right access to poles, and cap or eliminate permit fees and lease rates that allow cities to fully recover costs and create revenue streams. How Can We Leverage the Increasing Value of Our Street Light Poles? 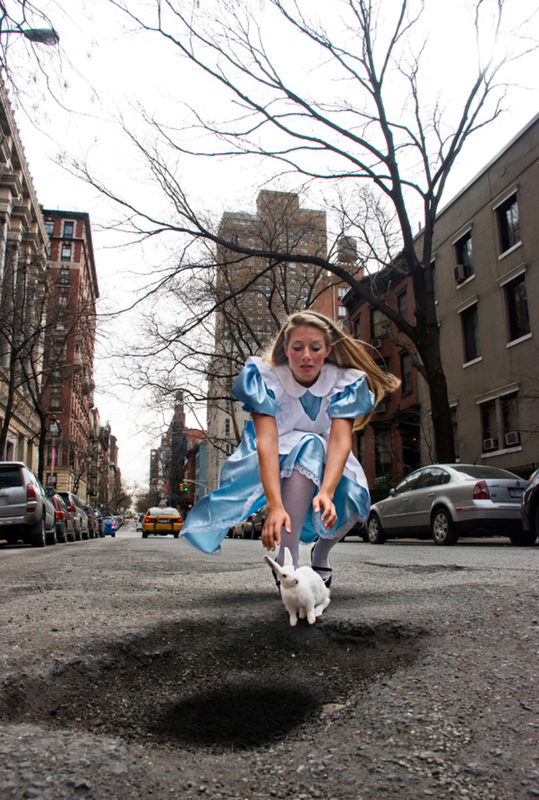 Like Alice, many cities aren’t being as strategic as they should be before pursuing the wonderland of IoT and smart cities technologies. Some see light poles only as a new revenue source, and most are unclear on what role their cities should play in accelerating broadband deployment. There are unique challenges to pursuing smart cities technologies from within local government: universal service obligations, mandated transparency and the inability to charge for many services. It is easy to get excited about flashy potential of Smart Cities and IoT devices and put the technology cart before the outcome horse. Many vendors are happy enough to take this approach, sell us some cool hardware and leave us with an incomplete and siloed smart cities portfolio that doesn’t deliver real value to our cities and their citizens. Are we putting people at the center of our strategy and solving problems that actually matter to them? Or is our approach vendor-driven? Are we being strategic about how we are trading the value of our street poles and other assets? Do we understand the use cases (i.e. real world applications) of the technologies we’re considering? What applications do our residents want and need? What technologies are mature and which are nascent? What are the technical requirements for those real world applications (e.g. operating system, sensor data aggregation platform, municipal broadband specifications)? Have we done the due diligence required to ensure that access to our poles will be non-exclusive? Have we thought through privacy concerns and, as a community, decided on a strategy to address them? Smart City IoT Architecture. Above and below are the real world use cases and problems we are trying to solve. These use cases should drive the architecture of the layers below it, not the other way around. 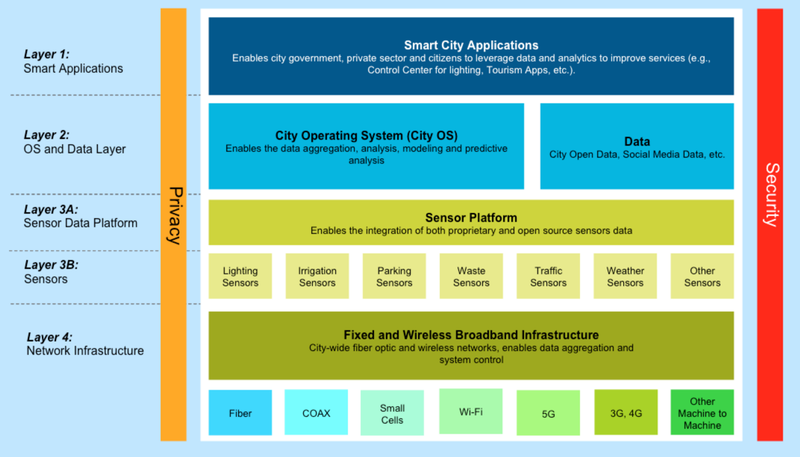 PC: City of San Jose, adapted from consultant analysis for City of Barcelona website, Cisco. We are asking ourselves these questions right now in San Jose. To answer them, we have decided to work iteratively to pilot and deploy IoT devices on our street poles and test out various use cases. Simultaneously, we are developing a city-wide strategy and policy framework that ensures we are putting people at the center of our smart cities approach. Go ahead and set out a big vision, but start small and iterate. Start to see your street light poles as THE platform for both IoT and small cells and begin to value them accordingly. Consider taking a platform approach that would allow both the integration of legacy technologies and competitors as well as your own. The city of the future will have to meet rising citizen expectations, by embracing mobile, data, and digital services. This will result in a new digital layer of our infrastructure, much of it powered by IoT. And many of these devices, and the networks supporting them, will want to reside on our street light poles. The future wants our street light poles. Don’t give them away lightly. 27 cities participated in the Harvard Innovation Accelerator in San Diego, CA to jumpstart progress on smart cities initiatives. Here are our takeaways.